Includes the York STS Half Rack and the weight bench they made to attach to it, the York STS Multi Function Bench. A "stringer" is included to connect them, to ensure that the bench is in the perfect position, doesn't slide, and the entire setup is even more solid feeling. The stringer can be easily disconnected as you switch exercises. A special "depth adjuster" mechanism of the bench lets you slide the pad several inches backward for incline position to stay right under the bar. So this setup totally avoids the common problem of the rear lower crossbrace of the rack getting in the way of the optimal placement of the bench. This setup is for intermediate and advanced level lifters who want the best. The firm pad of the STS bench will never bottom out on you even on the heaviest sets. At nearly 600 lbs, the STS power rack takes quite a feat to move or fail in any way. The rack has a pull up bar and also gives you the option of doing dumbbell exercises with the bench by disconnecting it from the rack. 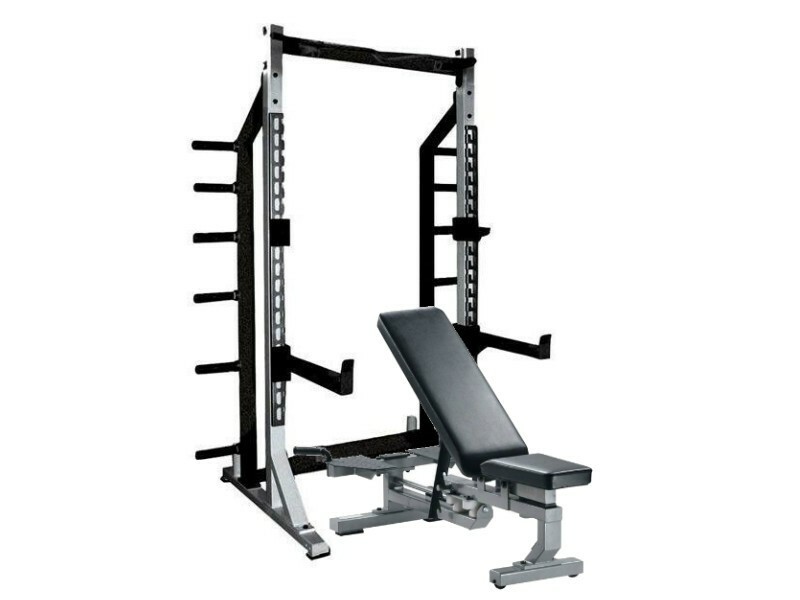 This package also includes the safety spotter arms for the half rack, to keep you lifting safely. This York STS half rack also has several other attachments you can add - dip handles, extra bar catches, and pulling platforms. Barbell and weights shown in pic sold separately. The first video below shows the bench along with a different rack. The second video shows the rack included in this set.